The B26 was developed during the Second World War. In 1950 it flew out from Japan on bombing runs in Korea but from 1951 they flew from Korean airfields. During the Korean War it is claimed that they destroyed over 38,000 enemy trucks and cars, 406 trains and even seven enemy planes on the ground. The plane needed a crew of three. It had a range of 2,300 kilometres and a speed of 570 kilometres an hour. It could carry up to 2,700 kilograms of bombs. 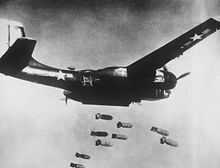 A B26 bomber dropping its bombs over Korea.